The first time Honda sold the Passport, the nameplate was applied to an Isuzu Rodeo with a different grille. 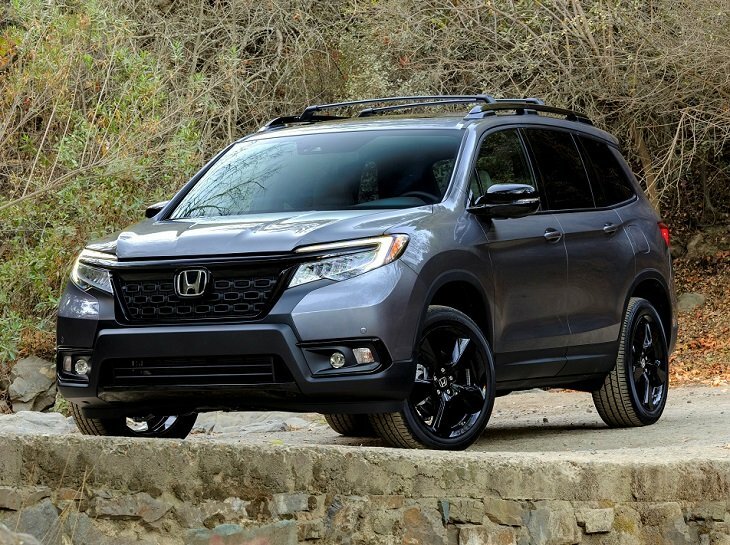 This time around, the Passport name is pasted to a 5-passenger Honda Pilot that is shorter in length, taller in height, and equipped with modified styling to underscore its more adventurous mission. While the new Passport looks much like the Pilot upon which it is based, most people will be able to tell the difference. It’s got a unique grille, different front and rear bumpers, revised tailgate, special headlights and taillights, and a bunch of extra body cladding. The Passport comes in Sport, EX-L, Touring, and Elite trim levels. All of them have 20-in. aluminum wheels, but each is equipped with a trim-specific design, according to Honda. In keeping with its more rugged look, the Passport gains both height and ground clearance. With the available all-wheel-drive (AWD) system, the Passport can clear 8.4 ins. of snow, rocks, or what-have-you. Inside, the Passport offers roomy seating for five people. Triple-zone climate control is standard, and all but the cloth-upholstered Sport trim level are equipped with leather. The interior is essentially identical to the Honda Pilot. Same dashboard, same giant storage bin between the seats, same unobstructed view forward. Storage is not a problem in this SUV, and cargo space measures 41.2 cu. ft. behind the rear seat and 77.9 cu. ft. with the rear seat folded flat. Under the cargo floor the Passport features an additional 2.5 cu.-ft. storage area. As is true of all Hondas, you add equipment by choosing more expensive trim levels. Or, you can dip into the extensive catalog of dealer-installed extras. Highlights of the EX-L trim include leather, a more sophisticated infotainment system, extra driver-assistance and collision-avoidance technologies, heated front seats and side mirrors, power tailgate, and more. Touring trim adds navigation, a 4G LTE Wi-Fi hotspot, premium sound system, heated rear seats, and a hands-free power tailgate among other upgrades. The Passport Elite includes standard AWD, plus a heated steering wheel, ventilated front seats, rain-sensing wipers, wireless smartphone charging, and fancier gloss black trim. All Passports are equipped with the same drivetrain as the Pilot. That means they’ve got a 280-horsepower, 3.5-liter V-6 engine and a 9-speed automatic transmission. If you’ve heard rumors about clunky shifting in Honda Pilots, don’t worry. Honda fixed the problem for 2019, and the new Passport is a beneficiary of this effort. Front-wheel drive (FWD) is standard unless you get Elite trim. Passport Elite versions include the torque-vectoring AWD that is an option for Sport, EX-L, and Touring trim levels. Up to 70% of engine output can flow to the rear axle, and then all of it can transfer to one of the rear wheels as is necessary. To make the Passport more capable off-road, ground clearance rises to 7.8 ins. with FWD and 8.4 ins. with AWD. A traction control system with Snow, Sand, and Mud settings also helps when the going gets tough. As is true of the Pilot, which earns top-notch crash-test ratings, the Passport is built around Honda’s Advanced Compatibility Engineering (ACE) vehicle architecture. Additionally, every Passport is equipped with Honda Sensing, a suite of driver-assistance and collision-avoidance systems that includes adaptive cruise control, forward-collision warning with automatic emergency braking, lane-departure warning with lane-keeping assist, and a road-departure mitigation system. Upgrade to EX-L trim for blind-spot monitoring, rear cross-traffic alert, and a free trial of HondaLink subscription services including automatic collision notification, emergency calling, and alerts related to how and where family members might be driving or using the Passport. In order to enjoy Apple CarPlay and Android Auto in a new Passport, you need to buy something other than Sport trim. That’s because these features are included with the upgraded infotainment system with an 8-in. touch-screen display. Touring trim equips the Passport with navigation, premium sound system, and a 4G LTE Wi-Fi hotspot. Honda includes a free 3-month/3-gigabyte data trial for the Wi-Fi, after which you’ll need to pay extra for the service.